Opposition chairman Shaul Mofaz speaks with PA Chairman Mahmoud Abbas, says it is time to renew the stalled peace process. 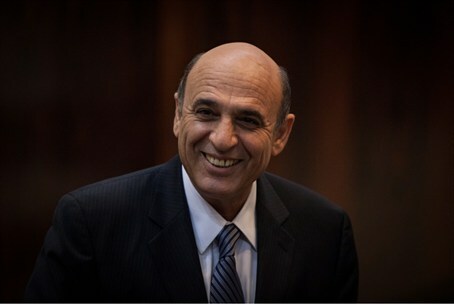 Opposition chairman Shaul Mofaz (Kadima) spoke on Sunday with Palestinian Authority Chairman Mahmoud Abbas and congratulated him on the Muslim holiday of Eid Al-Fitr, which follows the holy month of Ramadan. Mofaz used the opportunity to tell Abbas that it is time to renew the stalled peace process. “It is our duty to create hope for both peoples. The fact that the peace process is stuck serves the extremists on both sides, and not the will of the majority of Palestinians and Israelis,” Mofaz said, according to a report on Army Radio. The two agreed to coordinate a private meeting, noted the report. Mofaz has been attempting to bring Abbas to meet with him for many months. When Mofaz’s Kadima party joined Prime Minister Binyamin Netanyahu’s coalition, the peace process was one of the four major issues to be addressed as part of the coalition agreement between Likud and Kadima. Mofaz later publicly called on Abbas to take advantage of the large coalition and begin peace negotiations. “Forget the letters, forget the preconditions - Let's talk peace now. The coalition today is the widest ever, and this allows for a political breakthrough,” Mofaz told Abbas. A meeting between the two was finally scheduled for late June, but was cancelled for what the PA said was “public disapproval of the meeting under the current circumstances.” The meeting was never rescheduled and Mofaz subsequently pulled out of the coalition over differences regarding the draft law. Abbas has constantly demanded that Israel accept the indefensible pre-1967 lines as final borders, release all Arab terrorists from its jails, and halt construction in Judea, Samaria and east Jerusalem for a second time before talks begin. Israel froze construction in Judea, Samaria and Jerusalem for ten months in 2009 at the request of the United States, in an attempt to bring the sides back to the negotiating table. Abbas chose not to resume talks. In September 2011, Abbas applied for full UN membership at the UN Security Council. Israel and the U.S. staunchly opposed the bid, which failed due to a lack of support in the 15-member council. The PA now plans to once again turn to the UN for recognition as a state, this time to the General Assembly.